The thing is, this secret “niche” has more to offer. And would it surprise you that my own results are considered “ordinary”? But What If I Told You… You Don’t Have To Be An Inspiring Guru Or Motivational Speaker To Start Making A Fortune In The Personal Development Space? My name is Edmund Loh. You might already know me as an Internet Marketer that sells digital products, especially in the Online Business market. However what few people know is that I am also in the Personal Development space. … which later turned into a lucrative side income. … All these within less than 5 months. This might not sound that exciting to you but consider that just half a year ago, the only thing he knew was his job as a Bank Manager. And plenty more people are making a more than comfortable living with personal development products. You see, one of the biggest time wasters is creating your own offer. And yet, it’s a very important task. You need to have an offer, otherwise how are you going to attract people over let alone build your following right? Unfortunately, not everyone is cut out for offer creation. … Or… Do You Have To? 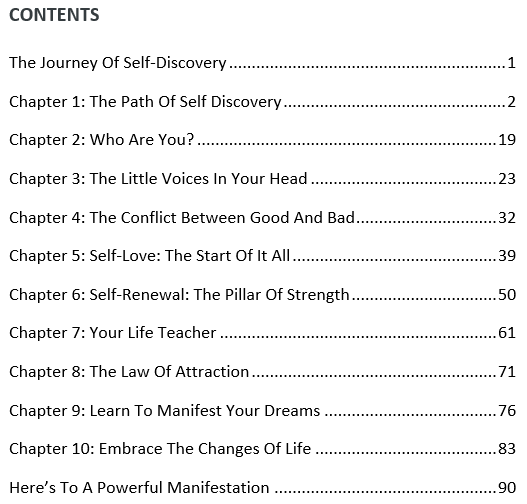 You get the 93 page E-Book, totaling a number of 25,108 words. That’s a generous amount of content you’re getting! To help you sell in the fastest time possible, I’ve written for you a sales page and thank you page that you can use right away. It’s not uncommon to spend at least a small fortune hiring a copywriter. And even if you try doing it yourself, writing a good copy can take at least several days. You save all these trouble by getting this ready to go sales materials – put in your order link or button, upload to your hosting account, and you can be in business by today. This simple but powerful addon alone can drastically increase your sales manifold! And because it’s done for you, you don’t have to hire a videographer or do your own. The MP4 video, audio and transcript for this sales video is included. Sure, you want to make money… but not everyone buys on first contact and that’s a fact. So what do you do with the rest of the traffic that aren’t buying from you on first impression? It would make sense to collect their names and email address first – so you can follow-up with them later! That’s why I am also including this Landing Page. This 22-page Special Report makes an excellent giveaway item or Bonus to generate leads and build your opt-in list! Like the main Product, you get the PDF version (to be used as-is) and also WORD version (to be edited and rebranded as yours). What do you do the moment your visitor joins your list? Send the first email! Then the second, then the next… then the next… Everyday. The more emails you send, the more sales you can close. So I’ve taken the liberty to write you a starting set of follow-up email series to load into your autoresponder – and I suggest they go on a DAILY interval. Add your website / sales page link in, personalize the emails further if you’d like to… and be closing sales on autopilot! If You Tried To Outsource And Get Everything Done Yourself To Produce A Similar Package, You’re Looking At Around $2,697 In Product Creation Expenses Alone! Product lifespan is LONGER in this market. You might be surprised to know that unlike other rabid niches like “Online Business”, there are actually more mailing list owners than there are products in this space. That means you don’t have to frantically launch new offers because you’re afraid they get obsolete fast. In general, personal growth teachings have remained consistent and are more timeless. Think of all the leverage you can get with FREE traffic! You DON’T Have To Be A Big Time Guru Or Speaker To Make Big Bucks In This Market. That’s easily one of the biggest misconceptions about Personal Development and in a way, I don’t blame you if you thought that way. For a long time, I believed that myth too. So imagine my surprise finding out how many ordinary folks are making an extraordinary income in the Personal Growth field! Besides making money, think how you can bring value and change people’s lives along the way. Isn’t that just amazing? Add Value And Get Paid! Most Of The Heavylifting Had Already Been Done For You! The Bar Has Been Significantly Lowered For You. And a further $10,000 on the sales copy ALONE. This is not something you can just make up. Ask anyone in this market and they can all vouch that these are ‘usual numbers’ in this business. … But also give you the foothold you need to get into this highly energetic, wildly profitable niche. So let’s cut the chase. It won’t be anywhere near what I’ve spent on my first Personal Development product. And you get everything you see on this page PLUS the Private Label Rights.